Внесен в Государственный реестр средств измерений за номером 51077-12. 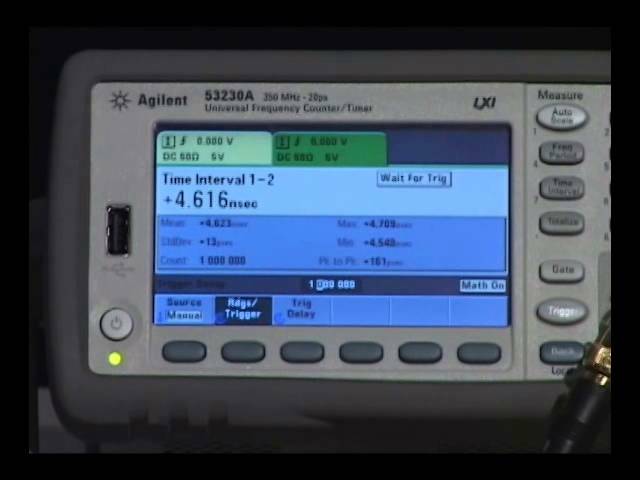 Двухканальный универсальный частотомер/таймер Keysight 53230A с диапазоном частот 350 МГц обеспечивает все необходимые возможности по измерению частоты и временных интервалов, а также непрерывные измерения и измерения без интервалов для выполнения базового анализа в модуляционной области. С прибором может быть приобретена программная опция для измерения параметров пакетных сигналов. Для измерения частоты в диапазоне до 6 ГГц или до 15 ГГц частотомер может быть оснащен дополнительным СВЧ каналом. 1. AC coupling occurs after 50 Ω termination. 2. When ordered with optional rear terminals, the standard/baseband channel inputs are active on both the front and rear of the universal counter though the specifications provided only apply to the rear terminals. Performance for the front terminals with rear terminals installed is not specified. 3. Multiply value(s) by 10 for the 50 V range. 4. Stated specification assumes Noise Reject OFF. Noise Reject ON doubles the sensitivity minimum voltage levels. 6. CW only. Assumes AM Rate > 10/gate. For Option 106, spec applies for input powers > -20 dBm; use a tolerance of 15% modulation depth for frequencies less than 900 MHz. For Option 115, spec applies for input powers > -10 dBm. 1. Maximum display resolution for frequency and period. 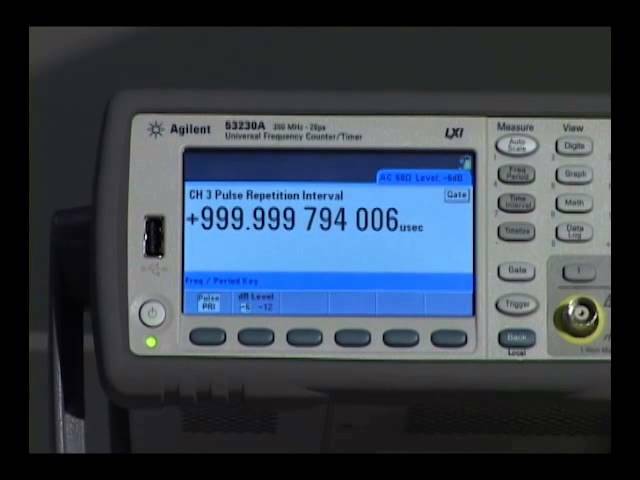 Totalize display resolution is 15 digits, time interval based measurements are 12 digits. 2. Continuous, gap-free measurements limits the gate time setting to 10 µs to 1000 s in 10 µs steps. 3. Refer to the gate characteristics section for more details on advanced gate capabilities. 4. Measurements on each input channel are performed simultaneously using one gate interval. The actual measurement gate interval on each channel will be synchrounous with edges of each input signal. 5. Maximum sample rate. Actual sample rate will be limited by the input signal edge rate for signals slower than the selected sample rate. Maximum timestamp rate offers minimal FM tolerance. If high FM tolerance is required, use lower timestamp rates. 6. Assumes two frequencies are identical, only shifted in phase. 7. Manual control of gate width and gate delay are allowed only for wide pulsed mode. 8. For pulsed signals > -7 dBm (100 mVrms) while gated on. 9. For totalize, time interval and frequency measurements, you may get measurement readings beyond the range stated, but the accuracy of those readings is not specified. 10. Applies when burst width * Carrier Freq > 80. 11. Specifications apply if measurement channels are in 5 V range, DC coupled, 50 Ω terminated and at fixed level for: time interval single and dual channel, pulse width, duty, phase, single period and rise/fall time measurements. 1. 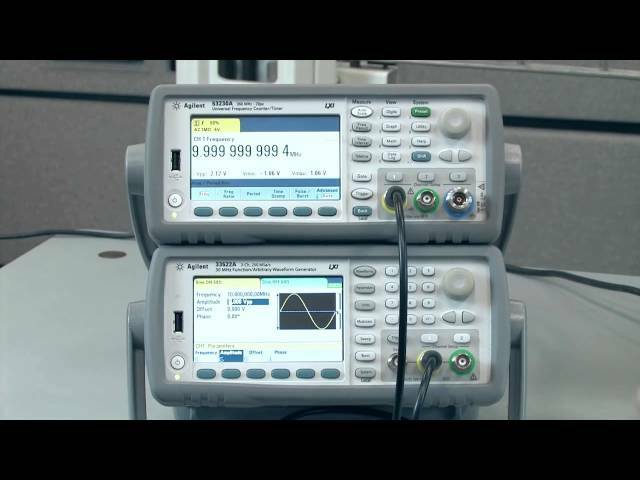 Continuous, gap-free measurements limits the Gate Time setting to 10 µs to 1000 s in 10 µs steps. 2. Latency does not include delays due to auto-leveling. Limit test 3 Displays PASS/ FAIL message based on user defined Hi/ Lo limit values. 1. These Math operations do not apply for Continuous Totalize or Timestamp measurements. 2. Allan Deviation is only calculated for Frequency and Period measurements. Allan Deviation calculation is available on both 53220A and 53230A, it is only gap free on 53230A. 3. Limit Test only displays on instrument front panel. No hardware output signal is available. 4. Operating speeds are for a direct connection to a >2.5 GHz dual core CPU running Windows XP Pro SP3 or better with 4 GB RAM and a 10/100/1000 LAN interface. 5. Throughput data based on gate time. Typical reading throughput assumes ASCII format, Auto level OFF with READ? SCPI command. For improved reading throughput you should also consider setting (FORM:DATA REAL,64), (DISP OFF), and set fastest gate time available. 6. 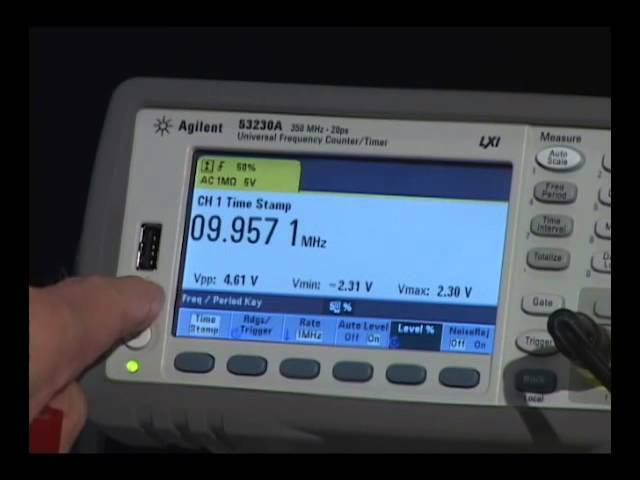 Maximum 53230A rates represent >= 20 MHz input signals with min gate times, no delays or holdoffs. Measurement rates for the 53210A & 53220A are limited by min gate time. Actual meas rates are limited by the repetition rate of the input being measured. Operating temperature limits 0 to 55 °C. Battery will only charge under 35 °C. Instrument running on battery power above 50 °C will turn off to minimize battery capacity degradation. 1. All Timebase Aging Errors apply only after an initial 30-days of continuous powered operation and for a constant altitude ±100 m. After the first 1-year of operation, use ½ x (30-day and 1-year) aging rates shown. 2. Additional temperature error is included in the time base uncertainty equation if the temperature of the operating environment is outside the TCAL ± 5 °C (calibration temperature) range. The error is applied in its entirety, not per °C. 3. Initial factory calibration error applies to the original instrument calibration upon receipt from the factory. This error is applied until the first re-calibration occurs after shipment. Settability error is the minimum adjustment increment (resolution) achievable during electronic adjustment (calibration) of the instrument. It is added to the uncertainty of your calibration source. 4. Warm-up error applies when the instrument is powered on in a stable operating environment. 6. Retrace error may occur whenever the instrument line-power is removed or whenever the instrument is battery operated and the battery fully discharges. Retrace error is the residual timebase shift that remains 72-hours after powering-on an instrument that has experienced a full power-cycle of the timebase. Additional frequency shift errors may occur for instrument exposure to severe impact shocks > 50 g.